I promise you that I will write about my fabulous trip to Austin, Texas, but I knew you would want to hear about my new pets first! I rescued the Fabulous Five at the Austin Airport, on my way to the gate. I selected this particularly aggressive jumping group of five after observing them for about 15 minutes. I was relieved that I didn’t have to pay the animal cargo fee, and also encouraged when they followed my instructions to keep quiet and not make any of those obnoxious “TICK TICK TICK” sounds in my carry on bag under the seat in front of me. They came with instructions for a silly and demeaning game, but more importantly, instructions for care. This was new to me. You have to open the little box to give them air, and they need water, too! No wonder my previous MJBeans had never lasted very long. It is, of course, a great sacrifice to open the little box, because they don’t make nearly as much noise that way. A responsible pet owner always considers the health and well-being of their pet, even if it is sometimes inconvenient for the owner. I opened the box. Much to my horror, in the morning, there were only Four Fabulous beans in the box! I looked under the instructions. I looked on the table. I looked behind all the other items on the table. Finally, I got down on my hands and knees and looked for my missing grayish-tan bean on my grayish tan carpet. My heart skipped a beat at every piece of lint, every small wad of Carefresh Pet Bedding, every . . . BEAN! But, no. This is the guinea pig room, the Dude Ranch, and it was not the same kind of bean at all. Five was missing. And so I learned that even the best pet care instructions can be disappointingly incomplete. Nothing, in fact, can prevent pure, unadulterated carelessness. Humiliated, I was determined to become a better MJBean owner. I removed the remaining Fabulous Four MJBeans from their Birth Box and introduced them to their new home. 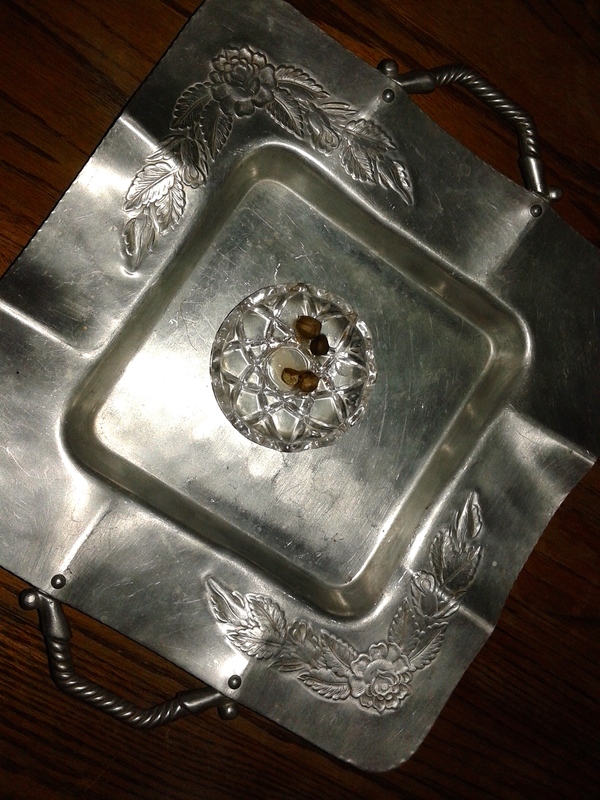 They now reside in a lovely cut crystal dish on an heirloom hand-hammered aluminum tray. They can jump all they want to, but I will find them (possibly even hear them) before they get too far. Please research carefully before you bring home any pet. Ask experienced, successful owners for insights. And always adopt if you can.